No more interleague games against the American League for a year. We’re finished with different teams, different pitchers, different hitters, different rules, different parks, different hotels, different time zones and different running water. The numbers aren’t pretty, 4-11 record, .220 batting average and 57 runs scored. Only the Padres (3-15) had a poorer record. Speaking of running water, the NL took a total bath: 102-149 (NL East 34-44, NL Central 41-51, NL West 27-54). The AL held the upper hand all around: .275-.251 average, 1,247-1,010 runs, 276-251 home runs and 3.69-4.56 ERA. For the record, there is one game left on the schedule, a June 26 rain out of the Yankees at Pittsburgh that is now set for July 10. So, so long to the AL and back to the NL. 19 of the next 25 games are within our division. Three months remain in the 2008 marathon season and every game and series is big. Despite losing five straight series, we will still be in first place tomorrow morning. In case you are wondering, the Phillies have been leaders on July 1 in seven previous seasons: 1950, 1976, 1978, 1993, 1995, 2001 and 2004. Last time we won a series was in Atlanta where we begin a three-game set tomorrow night. We swept three from the Braves there during the first weekend of this month. I’m sure the Braves haven’t forgotten. Appreciate the postings following Saturday’s Phillies Insider. Jenn added a cool suggestion for what to do with the bats, peg-leg for pirates. “Build a bandwagon that we’ll soon be jumping off” was another posted comment. Another clever idea but don’t leap. 1932 Chuck Klein hits 23rd and 24th homers in 9-3 win over Brooklyn at Baker Bowl, the most home runs at that time by the end of June by any National League player. 1938 New York Giants romp, 14-1, over the Phillies in final game at decaying Baker Bowl before 1,500 fans. On July 4, the Phillies moved to Shibe Park, home of the Philadelphia A’s. 1967 Cookie Rojas pitches scoreless ninth inning in 12-3 loss to the Giants, 2nd game. Rojas has now filled all nine positions since joining the Phillies in 1963, and played eight different positions this season. In case you haven’t noticed, we are scuffling. The offense has gone south since the 20-run win in St. Louis on Friday the 13th. **Burn them in a bonfire. **Invite a colony of termites for a feast. **Sell them to a toothpick factory. **Dip them in The Bull’s spicy barbeque sauce. **Stick them in a freezer to make them harder. **Drape them with flowers as a sign of affection. **Send them back to the forest. **Grind them into kitty litter. Charlie Manuel was the pre-game story yesterday as he drastically changed the lineup on his V-8 Machine. While the Phillies still struggled with runners on base, the slump, streak, nose-dive, decline–whatever you want to call it–came to an end. 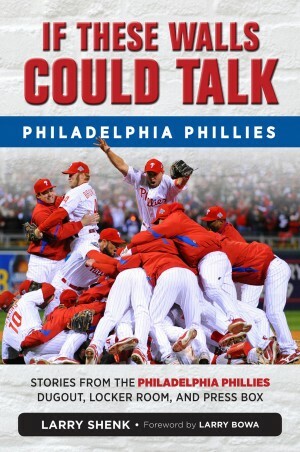 The game story belonged to Kyle Kendrick and Chase Utley. Kyle dominated the A’s for eight innings, throwing 71 strikes out of 113 pitches. He demonstrated what command can do, especially pitching inside to a lineup dominated by left-handed hitters. Going into the game, LH hitters were batting .328 against him. Utley broke out of his mixup with a four-hit game–single, double, triple, single in that order. When asked how worried he was over Utley’s recent struggles, Manuel said, with a grin, “I was scared to death,” as Todd Zolecki reported in this morning’s Inquirer. Eric Bruntlett, Mr. Versatile, made his first start at first base last night. He borrowed Rich Dubee’s first baseman’s mitt. Frank Coppenbarger, he of equipment fame, needs to order Eric’s own glove. So, winning two of three comes down to this afternoon’s rubber game. Next, three games in Texas (different time zone) and three games next week in Atlanta (another different time zone). Rollins ss; Utley, 2b; Burrell, lf; Howard, 1b; Dobbs, 3b; Victorino, cf; Werth, rf; Jenkins, dh; Ruiz, c. Adam Eaton on the mount. Lehigh Valley OF Chris Snelling has been placed on the DL (left knee inflammation) . . . Clearwater RHP Kris Benson has been promoted to LV . . . Clearwater RH reliever Brett Harker is moving up to Reading . . . Reading LH reliever Jason Kershner was released. OF Zack Collier was named to the USA TODAY High School All-Star team . . . SS Anthony Hewitt was selected to the second team. Hewitt and Collier were the first two players we selected in the draft earlier this month. In response to a comment yesterday, Doug Mansolino is wearing #53. 1987 RHP Steve Bedrosian ties major league record (Sparky Lyle, Yankees, 1973) with his 11th saved in last 11 appearances, 5-2, over Mets. When things are going good, you can feel it. When things aren’t going good, you can feel it. A key base, a big pitch, a defensive play….all part of winning games. Right now, it just isn’t happening. Every little thing is magnified. *Pat Burrell’s home run last night gave us a lead for the first time since the Monday game against Boston. That’s hard to believe. *Jamie Moyer was brilliant. Yet, one pitch did him in. *Trailing, 3-2, in the 8th, J. C. Romero gave up a two-run, opposite-field home run to a left-handed batter who has been scuffling. It was the first homer by a lefty off J. C. since April 2006. It is a case of hanging in there and battling until things get turned around. RHP Kris Benson made his second rehab start for Clearwater last night against Vero Beach: 4.2 innings, 7 hits (6 singles), 1 run (top of 5th inning), 1 walk, 3 strikeouts. “Command was better with all his pitches and he was down in the zone more often,” reported Steve Schrenk, pitching coach. Benson took the 2-1 loss. Clearwater had trouble hitting with runners on base. Three times with a man on third and one out, the next hitter struck out. They must be watching the big club. Came across a great story on the Oakland A’s website. Ryan Howard and A’s reliever Brad Ziegler were roommates in Clearwater four years ago. Ziegler was originally drafted by the Phillies. 1986 Phillies release Steve Carlton. In 15 years with the Phillies, he won 241 games, started 499 and struck out 3,031, all club records. He won 10 or more games for 13 consecutive seasons, another Phillies record. Still remember the night very well. Went into Bill Giles’ office well after the game was over. Bill still had tears in his eyes because he had to deliver the news to Lefty. Three teams in the majors have a winning record on the road and the Phillies (20-17) are one of the trio. The others: St. Louis (21-16) and Angels (24-12). Since 2004, only the Angels (202) and Yankees (194) have more wins on enemy turf or sod than us (192). When Jamie Moyer starts, we’re 10-5. Hopefully, these numbers bode well to end the gloomy five-game spiral. Against the A’s, we’re 3-3, winning two of three at home in 2003 and losing two of three in the McAfee Coliseum in 2005. The rest of the Phillies hitters have never faced the A’s. Charlie Manuel can use the DH tonight and for the next five days. The A’s are starting a RHP, LHP and RHP these three games. Most likely options: Burrell, Dobbs, Victorino, Werth, Bruntlett, Jenkins. Sorry, catching instructor Mick Billmeyer. We’re not activating a .247 minor league hitter who hasn’t batted in 15 years! 1994 Phillies sign two free agents, LHP Fernando Valenzuela and INF Randy Ready. Sorry, Fernando and Randy, but history is kind of bleak for this date. Perhaps something historic will occur tonight. Ending a five-game losing streak isn’t historic, but at this point, we’ll take it! Two weeks ago we swept the Braves in Atlanta. What a high. Now, we’ve dropped five in a row. What a low. Someone once told me: “Don’t get too low when the going is bad and don’t get to high when the going is good.” That someone? The late Gene Mauch. Manuel’s V-8 Machine has been misfiring. But, it will get going again. This is too good an offensive club to keep sputtering. Hitting is contagious which, I suppose, means non-hitting is the same. Bottom line: we’re in first place as we head for a tough nine-game road trip through Oakland, Arlington and Atlanta. In looking over various message boards, some fans are for it and others oppose it. One concern is quality of opponent. In our case, we have a very difficult interleague schedule. But, that’s the way it goes. “There’s no crying in baseball,” Tom Hanks, as manager, said in the movie, League Of Their Own. Still like seeing other players from teams in the other league, although Vladimir Guerrero can stay in California next time. During the month of June, the Phillies averaged more than 44,500 in their 11 home dates. The total attendance was 489,879. Ten of the games were sold out, including the last nine. Appreciate the most recent comments. Will get to searching for pitching in a later Phillies Insider. Just keep in mind discussing certain enemy pitchers is tampering and baseball has a huge fine for tampering. 1971 RHP Rick Wise becomes first pitcher in major league history to hit two home runs while pitching a no-hitter, 4-0, in Cincinnati. Wise is currently the pitching coach for the Lancaster (PA) Barnstormers in the Atlantic League. Von Hayes is the manager. 1973 Ken Brett sets a major league record for pitchers by hitting a home run in his fourth straight game, a 7-2 win in Montreal. 1978 Phillies beat Cubs twice by 6-1 scores at Veterans Stadium to take over the NL East lead, a lead they held for the rest of the season. 1986 Phillies bomb Cubs, 19-1, at the Vet, setting modern NL record with 15 extra-base hits and a new club record with 11 doubles. HRs by Juan Samuel (2), Mike Schmidt and Milt Thompson. Fortunately, or unfortunately–depending upon how readers view this blog–Phillies Insider will be blank as I’m going to be away for the weekend series against the Angels. Thanks for checking out Phillies Insider. Appreciate your passion. Rollins, ss; Victorino, cf; Utley, 2b; Howard, 1b; Burrell, lf; Jenkins, rf; Dobbs, 3b; Ruiz, c; Kendrick, p.
24 hours after the Phillies had taken the NL lead in runs scored, LHP Jon Lester and his bullpen mates tossed a shutout, setting up the rubber game this afternoon. Phillies offense has been inconsistent at times but credit last night goes to Lester, who was involved in his fourth scoreless outing of the season. 60 years ago today Robin Roberts made his major league debut, as was mentioned in this space yesterday. A young man the National League believes has a date with pitching stardom . . . a spunky, right-hander with a violent fast ball, a crackling curve and though still a raw rookie in a professional sense, has no fear of any hitter he faces. Signed out of Michigan State, this imperturbable youngster debuted in the Inter-State League with Wilmington last season, fanned an average of nine per game, won nine of 10 decisions and was brought up in mid-June. Pitched 10 complete games, won 7, lost 9; fanned 84 and in all worked in 20 games. Beat Cincinnati three out of three; also scored wins over Boston, Chicago and Pittsburgh. Chase Utley continues leading all NL players, which is great. Matter of fact, his lead over the second-place vote-getter (Chipper Jones) increased. Pat Burrell moved from ninth to sixth and Jimmy Rollins from fifth to fourth. But, Ryan Howard, dropped a notch to fifth place. Rollins had the second most votes among shortstops over the past week which is good news. We need to get behind our players. In-park voting ends Saturday but online voting continues until 1:59 p.m. July 2. Fans can vote up to 25 times on phillies.com. OF Greg Golson (Reading) has been placed on the DL with a left wrist strain . . . RHP Tyson Brummett (Clearwater) has been promoted to Reading . . . OF Michael Taylor and RHP Drew Naylor (Lakewood) have been moved up a level to Clearwater. Each was having a banner year with the BlueClaws. Rollins, ss; Victorino, cf; Utley, 2b; Howard, 1b; Burrell, lf; Werth, rf; Feliz, 3b; Ruiz, c; Moyer, p.
Citizens Bank Park was really alive last night, electricity as in a playoff game. Jimmy Rollins got the juices going with his lead off home run, his 28th, which is twice as many as the Phillies previous record holder, who happens to be Juan Samuel. Ryan Howard is getting hot. The two MVPs were the catalysts and Cole Hamels did the job on the mound. Something different seems to happen in every baseball game. Triples by Howard and Pat Burrell in the same game…..that’s something different. Howard now has more triples than J-Roll, 2-1. That’s something different. Thanks for the feedback on Juan Samuel. He is a special person, on top of being a very good ballplayer. Sammy’s evening yesterday started with an appearance on Comcast SportsNet’s Daily News Live from the field. 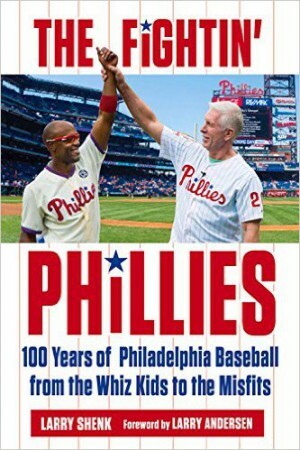 It was followed by a press conference in the Media Room, 30 minutes of autographs in the Hall of Fame Club, Phillies-pre-game radio show with Jim Jackson in the Main Concourse, in-game Phillies TV and Spanish Radio. Wherever he went yesterday, people knew him…..media, players, coaches, managers, game day employees, club officials and the fans. He was smile city last night. He’ll be on the mound again tomorrow, wearing that familiar number 36. The motion will still be fluid but the speed won’t register on the radar gun. “He” is Hall of Famer Robin Roberts. To commemorate the 60th anniversary of his major league debut (June 18, 1948), Robbie will throw out the first ball. Robbie was a pitcher with a blazing fast ball, awesome curve and pinpoint control. His motion was as fluid and smooth as any who hurler who has graced this game. He never backed hitters off the plate and paid for it by allowing a ton of home runs (505). In the end, he won 286 games and made it to Cooperstown, NY. To say he was a workhorse would be a gross understatement. For six straight seasons starting in 1950, he never threw under 304 innings. He would have set insurmountable pitch-count records but pitch counts didn’t exist back then, thank goodness. At one point in his career, he had 28 consecutive complete games (8/25/52 to 7/5/53). Robbie led the majors with 33 CG in 1953. The game has changed. The Diamondbacks staff led the NL last season with 7, a month’s worth for Robbie. Robbie, now 81, will be honored as part of Toyota Alumni Night set for Saturday, August 9. Family, friends and ex-teammates will join Phillies Alumni that night. All fans will receive a commemorative print of Roberts, thanks to Toyota. 1930 RF Chuck Klein hits in 26th straight game (.432), May 18-June 17, a new modern club record. He hit in 26 in a row again the same season (.434), July 12-August 13.